TO me he looks like he has never adjusted to the fact that unlike HS, in college he is at best marginally athletic and often one of the least athletic people on the floor. He keeps thinking he can do things he did in HS but it doesnt work in D1 ball. He came with the reputation of being more athletic than his brother and he was more of a star in HS than Tyler was. His driving game hasn't translated so well to the college one. But he can still be an effective player for us if he can pick his spots better and doesn't try to do more than he can. Other aspects of his game have improved though. He's improved his defense, rebounds well and will probably lead the team in assists. A lot of his problem is also that he probably can't meet the expectations he came with. Last edited by BlueK; 11-07-2018 at 02:22 PM. Looking to be in town Friday night and may take my girls to the UVU game. Any better place to get tickets than the ticket office? Where's DDD when I need him? his shooting hasn't translated either. He has mastered the turnover game though, there's that. TJ actually had 7 turnovers, for some reason one of them was marked as a team turnover, and then he threw that pass off of Dalton Nixons foot and they gave that turnover to Nixon. Martin locked him down. He was longer, quicker, more athletic. TJ didn't know what to do. He should have stayed around the perimeter and shot spot up threes. Also Jashire is officially the guy where the ball movement goes to die. How many times did he hold the ball at the top of the key and jab step, before launching an ill advised three. He should never lead our team in shots. Again Bergerson is not a D-1 player. Harding is Toolson 2.0, he will play a nice role this year. Kolby Lee runs like a mongol. Luke continues to miss bunnies inside. This team needs Nick Emery. Seljaas actually had 5 really good looks from deep in the first 10 minutes (only made 2, but I can live with 40%) Nevada adjusted and he couldn't get a shot off after that. Nevada was the better team. We weren't going to win that game. I am glad for the most part we kept it close. But if we can't hit from 3, it is going to be a really long season. Last edited by cougjunkie; 11-08-2018 at 12:35 PM. As a freshman he shot 40% from 3. Last year it dropped 10 points from that in Schroyer's offense. It's too early for this year to tell if he can go back to his earlier success. Maybe he can't, but I'm still going to hope for a couple more games that changing to a more traditional Rose offense will help his shot. I still think he takes a lot of heat from the fans because he came with even higher expectations than his brother and because he looks goofy. Last edited by BlueK; 11-08-2018 at 11:05 AM. I haven't seen the team yet this year, is he still sporting that lesbian haircut? I think you two and BlueK are talking about different players. As ugly as Zac's haircut was, he was still a way more attractive lesbian than TJ could ever hope to be. Also Jashire is officially the guy where the ball movement goes to die. How many teams did he hold the ball at the top of the key and jab step, before launching an ill advised three. He should never lead our team in shots. Pretty much agree. Doesn't Harding have more length than Toolson, though? yikes. NCAA dropped the hammer on BYU. Two years of probation from Nov. 9, 2018, through Nov. 8, 2020. A vacation of records in which the student-athlete participated while ineligible. A reduction of one men’s basketball scholarship, served during the earliest possible academic year (self-imposed by the university). Recruiting restrictions detailed in the public report. A disassociation of one of the boosters (self-imposed by the university). LOL. If this exact same silly scenario happens at Duke, Kentucky, Kansas or even mid level power conference basketball schools like Texas, Washington or Arizona State, does the NCAA even bat an eye? This game is difficult to watch. Our offense. What in the world is it? Dribble. Brick. Dribble. Turnover. Repeat. Would be nice if Yo would post up more than brick 3s. We didn't make it to the game tonight. Caught a few minutes on the radio just before halftime and was kind of glad not to be there. I didn’t catch the game but SVP just made fun of the ginger Holy Ghost for turning it over with 8 seconds left up 12 which allowed Toolsen to score and thus beat the spread. It was kind of bush league. Game was over. 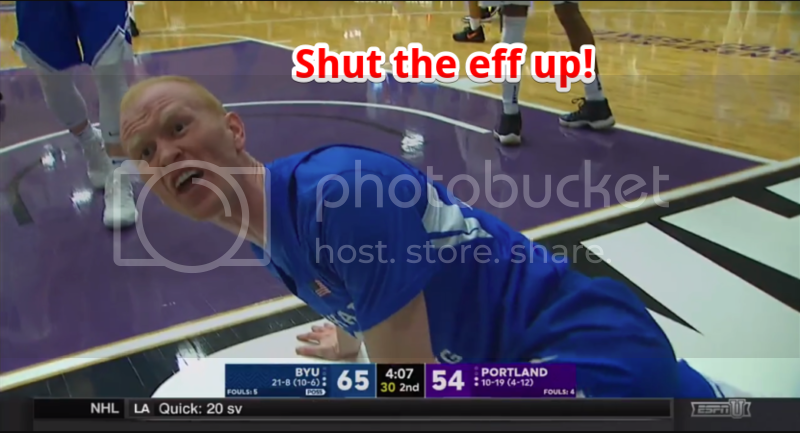 BYU was dribbling out the clock to end the game. Then they jump on TJ, steal the ball and lay it in with .5 second left. I don't think Rose appreciated it either. He gave Pope the Randy Bennett handshake. Hardnett ... So far it appears he is merely going to have a good year—nuts. Seljass ... Can we trade him and Bergersen for Jake Toolson? Harding ... Wish he was more Jimmy Balderson—maybe with more time? Last edited by tooblue; 11-10-2018 at 07:00 PM. I spend every game hoping tooblue's MVP picks up fouls so he will go to the bench.